A capacitor is a component that can be used to store an electrical charge. Its basic design is two plates, each with a lead attached for connection to a circuit. The plates are separated by a thin insulator called a dielectic. Commonly, the plates are made from thin metal foil, and the dielectic is a thin film. 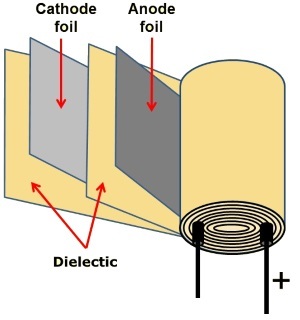 The plates and dielectic film may be rolled up to form a cylindrical package. When connected across a voltage source, electrons will flow onto the plate connected to the negative side of the power source. 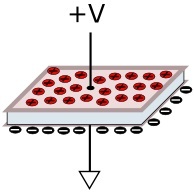 These will repel electrons from the other plate, causing a charge across the capacitor. The amount of charge held on a capacitor's plate is measured in units called farads (F) after Michael Faraday. He is the English scientist who discovered electromagnetic induction, the principle behind the electric transformer, motor, and generator. A farad is the charge of 6.25 billion billion electrons. A capacitor that can be charged to a potential difference between its plates of 1 volt in a time of 1 second during which it draws 1 amp has a capacitance of 1 farad. Because the farad is an Impractically large unit, capacitances are measured in smaller units. Without a resistor in series, current would flow into the capacitor very quickly and the capacitor would act like a short circuit. Similarly, if the leads of a charged capacitor were connected to each other without a resistor in series, current would flow very quickly and the discharge would create a spark. A capacitor used with a resistor in series requires a finite time to discharge. A capacitor can be used to create a timer. This time delay can be used to smooth a changing current flow in a circuit, or it can be used to absorb spikes and prevent false triggering of other components. 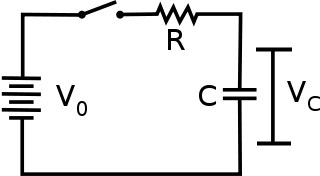 When a capacitor is placed in series with a resistor across a DC power source, it initially has no charge on its plates and no voltage across it. In the circuit shown above, when the switch is closed, electrons begin flowing through the resistor onto the capacitor's plates. Shown above are equations for the voltage across a capacitor while charging (top) and discharging (bottom). The number e is the natural logarithm. The constant was discovered by the Swiss mathematician Jacob Bernoulli, but it is sometimes called Euler's constant after the Swiss mathematician Leonhard Euler who chose the symbol e to represent it. The number e is a magical number like pi which keeps reappearing in mathematics and nature.